CyberHour Review 2019: Is CyberHour a Good Hosting? CyberHour is a Bulgarian hosting provider with some beginner-friendly features. You’ll pay a premium for its plans, but you’ll get data privacy, SSD storage, and a 99.9% uptime SLA. Founded in 2012, Bulgarian company CyberHour offers affordable offshore hosting. It provides more than 12,000 customers (10,000 of which are “happy”) with more than 13,000 hosted domains. The website is provided in American and British English, Bulgarian, and Greek. CyberHour’s servers are colocated in the Sofia Data Center (SDC) in Bulgaria. Although the company doesn’t own its own data center, you can take comfort from the fact that this Tier III data center should mean less than 1.6 hours downtime per year. There is a compensation-backed uptime service level agreement of 99.9%. However, this comes with the caveat that “credits will be made available to each client on a case by case basis” so you can’t be sure what compensation you’ll get. CyberHour makes a big thing of the fact that it is an offshore host for “security-conscious enterprises around the world,” with data protected by Bulgarian law. While I don’t know exactly what this means in practice, I think it’s safe to assume your data is safer from prying eyes (even government ones) than if you were hosted in one of the “Five Eyes” countries such as the United Kingdom and the United States. In this context, some (but not many) of you might be interested to know that CyberHour hosts some of the most popular adult websites! And they don’t keep any logs. The plans come with some beginner-friendly features such as a QuickInstall tool for one-click installation of popular programs, and a drag-and-drop website building tool with pre-built templates. The situation for advanced coding features is a little less straightforward. Although I confirmed via live chat that PHP, MySQL, phpMyAdmin, and Cron jobs are included in the shared hosting plans, you’ll need to choose a VPS plan if you want support for any advanced coding languages or root access. Given the relatively low level of features in the shared hosting plans, I’m surprised by the premium price point. The lowest ‘Base’ shared hosting package comes with three domains, 20 GB SSD storage, and 350 GB bandwidth, which is more than enough resources for everyday users. However, the price is high for so few expert features, and you’ll need to upgrade to the VPS plans for more. Plans can be bought on terms ranging from one month to three years. The prices reduce a little if you purchase a longer term, but certainly not sufficient for me to do so. SSL certificates are included, but domain registration is an added cost. There is a minuscule three-day money-back guarantee that doesn’t give you much time to decide if you made a mistake. Sales support is available Monday to Friday during slightly later-shifted business hours, and you can contact them by live chat, ticket, or email. 24/7/365 technical support is available only via the control panel. 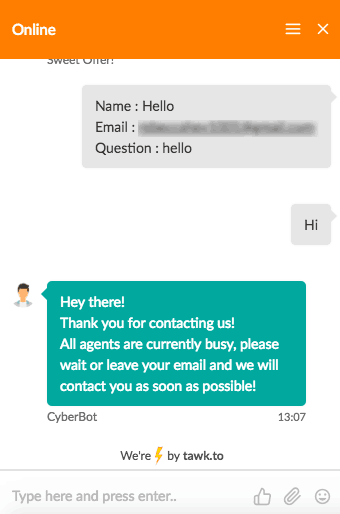 I attempted to contact this company by live chat whilst it was apparently online, but a chatbot asked me to enter my email address along with my message, which I duly did. Unfortunately, the first time I contacted support, I never heard back despite waiting for around 48 hours, so you can only hope that the technical support team is more responsive when your website is down. Fortunately, an operator did pick up the second time I tried to chat, and then answered my questions. There is a relatively active community forum on the website, which might offer a better way of solving any problems rather than contacting the company itself. CyberHour provides high-privacy hosting with SSD storage and a 99.9% uptime guarantee. The higher packages are pricey, but the Base plan comes with a comprehensive level of resources and some good beginner-friendly features. Wondering how CyberHour stacks up against other Web Hosting companies? Enter any other Web Hosting company and we will give you a side-by-side comparison.